ItemBARK_1979.0058.0105 - 1941 Christmas card with unidentified Chinese man standing near waterfall. The back lists several Vancouver businesses: Tourist Confectionary, Holly Lodge Grocery, Belmont Confectionary and Columbia Confectionary. Item BARK_1979.0058.0105 - 1941 Christmas card with unidentified Chinese man standing near waterfall. The back lists several Vancouver businesses: Tourist Confectionary, Holly Lodge Grocery, Belmont Confectionary and Columbia Confectionary. A black and white Christmas card. 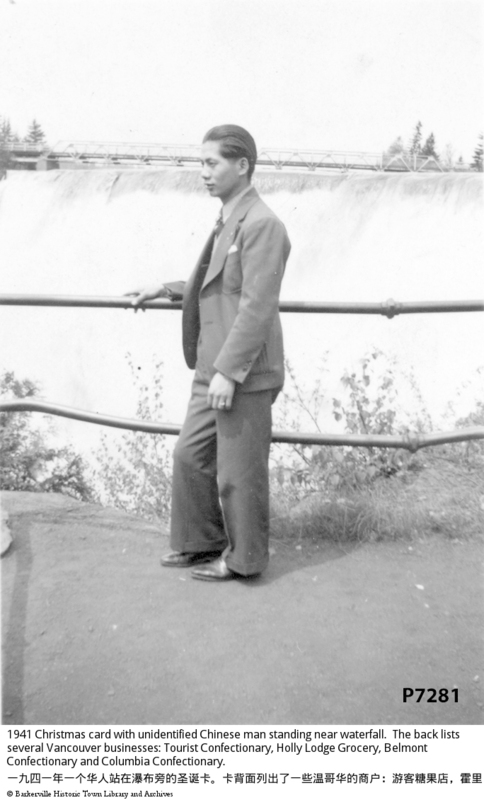 A Chinese man standing alongside a waterfall. Right side of cardboard reads: "1941, Best Wishes for a Very Merry Christmas and a Happy new Year...", with designs, star and flowers. Reverse side reads: "Trouist, Trorist, Colnf (?) 204Main St. Vancouver. Belmont Confection, 999 Granville St. Vancouver, B.C., Holy Ladge Grocery, 1254 Mavie St., 105 Lardova(?) St., Van, By Columbia Conf. 292 Calumbia St. Van" Dimensions: 5.1 cm x 7.5 cm. Back of card has addresses of several businesses in Vancouver: Tourist Confectionary 204 Main Street; Belmont Confection 999 Granville Street; Holly Lodge Grocery 1254 Davie Street and 105 Cordova Street, and Columbia Confectionary 292 Columbia Street.